With the crazy concoctions they send down the runways, it can sometimes seem like fashion designers live on another planet. However, not only do fashion’s elite inhabit the same Earth as us, they also care about making this world we share a better place. In this new bi-weekly series, I’m going to highlight designers who are doing their part to help out those in need around the world, and how you can help as well, just by supporting them! I hope you enjoy it! While doing a final study abroad splurge at Topshop last semester, I noticed bins of adorable bracelets by the cash register. I couldn’t help but pick one up when I noticed the brand–Fashion Targets Breast Cancer. Aside from the fact that the bracelet’s simple black and white circle design (the “target”) was adorable and would match literally everything, the knowledge that the proceeds went towards breast cancer research had me completely sold! When I got home, I decided to research Fashion Targets Breast Cancer to see what it was all about. To my surprise, the brand is the brainchild famous fashion designer Ralph Lauren and is an initiative of the Council of Fashion Designers of America (CFDA). Founded in 1994, the organization has raised millions of dollars to distribute to accredited breast cancer charities. The best part? Since I know there are CF readers around the world, I was super excited to see that Fashion Targets Breast Cancer is not just located in the UK where I had found it but also in the US, Brazil, Ireland, Australia, Greece, Cyprus, Japan, Canada, and Portugal. Therefore, it’s almost everywhere you guys are! 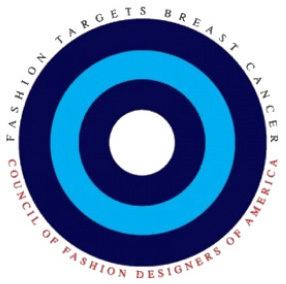 Fashion Targets Breast Cancer has different merchandise for each of its worldwide locations, so the best way to get involved is to check out the organization’s website to see what you can get and how you can make other sorts of contributions. For more information on the charity itself, check out its section on the CFDA website as well. Of course, my favorite way to give back to fashionable charities such as these is to shop, so here are some of my favorite products available in the US. Be sure to tell me your favorite Fashion Targets Breast Cancer products in the comments! Bright, attention-commanding colors are huge for summer, and my favorite for sure has been vivid turquoise. 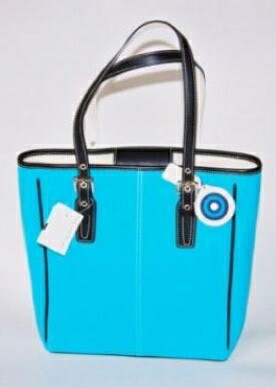 It’s no surprise, then that this tote grabbed my attention – the color is so summery and fun. In addition to its good looks, this tote would be perfect for carrying around all of your necessities, whether you’re heading off the the beach (it’s the perfect size for a towel) or an internship (you could easily fit your laptop right in). The trendy color will look great with a tan, while the classic style and sturdy shape will make it a must-have to throw over your shoulder for years to come. Designed by Betsey Johnson, this FTBC tee has an adorable take on the organization’s symbol. Since it is a Betsey Johnson tee, and we all know how creative her style is, I wanted to go for a fun look here! I picked up on the pink in her signature kiss symbol with silky, stylish tap shorts to tuck your tee into. Next, whimsical wedges continue the all-out girly look, as do the pink-rimmed oversized sunglasses. Go over-the-top with your styling by rocking sky-high, thick lashes (I just bought a tube of Maybelline’s “the Falsies” and I am in love!) and super-sized hair (use a thickening, texturizing spray to help). Have you heard about Fashion Targets Breast Cancer? Do you have any products from them? What other fashion charities do you know of/support? Let us know in the comments!